Lisa Nunziella was born in Brooklyn , New York. With a background in all forms of dance and gymnastics, she brings to the dance floor a level of energy rarely seen today. Lisa is truly one of the great, all-round dancers that could leave you speechless, whether she is performing a death defying routine or just taking command at a dance studio. She currently resides in California with her husband Rob, a functional movement trainer, triathlete and coach, and son Jack. She literally conquered the Hustle world. She competed and performed all over the world, winning virtually every title with various partners - Eddie Vega, Danny Llaurado, Ricky Quintana, Arte Phillips and Deano Georgio. She is a true pioneer of the hustle we dance today. Lisa was undefeated winning 13 consecutive weeks (never done before) on Ed McMahon's nationally-televised "Star Search", winning the $100,000 Grand Prize with partner Eddie Vega. A consummate professional, she has landed numerous movie roles in Hollywood. Some of her movie credits include "Dance With Me", "Mambo Kings", "Naked Gun 2½" and "The Mask". On television, she has appeared in "Fame L.A.", "Pearl", "Fresh Prince of Belair", "Star Trek DS9", "Beverly Hills 90210" and "Dirty Dancing", and the Prince video "Diamonds and Pearls". Lisa is one of the top choreographers for fitness competitors, and has extensive knowledge of all Ballroom and Latin dances and adagio, dynamic acrobatic lift work with a partner. She is an AFAA-certified Personal Trainer and Fitness Instructor, teaching Hip Hop, Cardio Dance, Bodysculpting, Salsa and Slide. In Martial Arts, Lisa's interests range from kick boxing to Kenpo Karate. She has her black belt in Shorin Do Kenpo; her Sensei is Master Robert Temple. 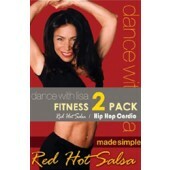 Lisa's Salsa Dance products are available on Zone Free DVD.